What eighteen year old Mac Thorne doesn't know will probably kill her. In exactly eight months, five days, three hours and thirteen minutes, Mac has to choose what she'll be for the rest of her life. She has no choice but to pick. As a Changeling, it's her birthright. To Mac, it's a birthchore. Like going to school with humans, interacting with humans, and pretending to be human during the pesky daylight hours. Once darkness descends, Mac can change into any supernatural form that exists-which makes her as happy as she can be. That is, until Winn Thomas, the biggest geek in her senior class, figures out there's more to what hides in the dark than most are willing to acknowledge. In this first of the 19th Year Trilogy, Winn might know more about Mac than even she does, and that knowledge could end their lives, unless Mac ensures the powers-that-be have no choice but to keep him around. After reading the synopsis for After Dark I was excited to get my hands on this new paranormal series and Emi Gayle started with a bang. It’s the story of a changeling who must determine by the end of her nineteenth year what type of supernatural creature she will be and take her rightful place on the council. Action-packed and filled with supernatural creatures I was immediately swept into the world and its characters. The tale begins when we meet eighteen year old Mac Thorne as she rapidly approaches her nineteenth birthday. She is a changeling and has lived with her guardians a vampire and a witch as she hones her skills and chooses her destiny. Like any typical teen at this age she isn't sure what she wants to be when she grows up. By day she attends school with “humans” and at night she takes the form of all kinds of supernatural creatures. Things are about to heat up for her, as something is attacking her, she interacts with "humans" and the council begins to pressure her to choose her destiny. She meets Winn Thomas, a geeky, smexy senior who is carrying around an ancient book about her and she sets out to get it from him. The tale that unfolds was delightful. Mac is strong, stubborn and determined. She is also smart, snarky, and a total badass. We see tremendous growth in her as a character over the course of the first book and it was fun to watch. She is a changeling faced with selecting one creature but the author hints that Mac is more and I cannot wait to discover what. Winn is such a loveable guy, he is sweet, cute and believable. He is a good guy and I found him to be charming, witty and bright. His little sister was interesting from the start and added to the tale. Her guardians were present, supportive and I loved the demon that interacted with them. The council was a hoot and they each had their own unique voice. Gayle weaves an original tale that blended paranormal and urban fantasy. I quickly connected and slipped into that sweet spot I love when I am engaged in a good book. The world-building was well done, with suspenseful threads and foreshadowing throughout. I found the council and supernatural creatures to be fascinating and am anxious to learn more about them. We see some intense action scenes that will leave you breathless, mixed in with funny, romantic and insightful moments. The author gave each character a distinct voice and steered away from the usual tropes in young adult. There is no insta-love, triangle or absentee parental unit. It was so refreshing. The romance that develops was sweet to watch unfold and built slowly out of trust. The tale ends without a cliffhanger and gives us a clear sense or expectation of where the next book will take us. 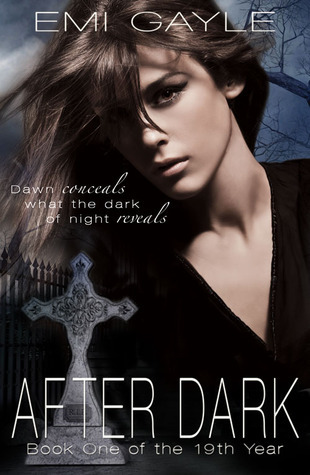 After Dark is a must read for those who enjoy young-adult paranormal and urban fantasy. Day After the next book in the series released May 6, 2013 and you can find my review here on the blog May 23rd. An awesome start to this trilogy and I will definitely be reading more of Gayle’s works. This is on my TBR list, it sounds fantastic and I can't wait to find the time to get to it in the next couple of weeks now. :) Emi sounds like a character I'll love. Wonderful review, Kimba! Great review, I want to add this one to my wishlist. Oh yea... this sounds like something I would enjoy. Really like UF YA. I'm also thrilled that it stays away from the usual tropes. Oh right there makes me want to read it. Yea... yea...the snark also made me perk up. Must add this series to the wishlist!